Rogation Monday Key auction selling grazing rights Great Wishford, Wishford Magna, Wiltshire. Key Auction Great Wishford, Wishford Magna, Wiltshire England. The Auction took place on Rogation Monday, the first of the Minor Rogations. 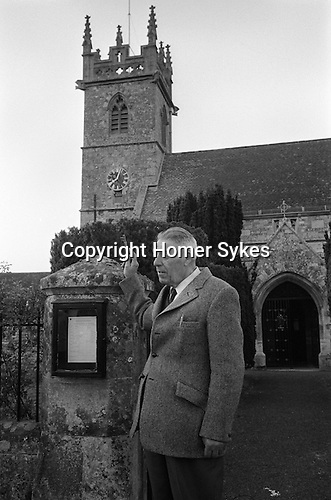 In 1975, the churchwarden as was the practice stood by the church gate, using the church door key as a gravel. Bids on the summer grazing left to the parish many centuries ago were auctioned. The last person to bid before the sun disappears secured the Midsummer Tithes for the following year. The Midsummer Tithes consist of the foreshore, or first cut, on two parcels of land in the parish. The first piece of land is Bonham’s Mead which is 2 acres and 2 roods (4 roods equal 1 acre), and lies on both banks, just below Duck Island, on the southern outskirts of the village towards Wilton. The other parcel of land is Abbey Mead which is 3 acres, 2 roods and 30 perches and lies about 200 yards past Wylye Cottage between the back road to Langford and the river. It was recorded by the Charity Commission in 1833 that ‘...there are no deeds or documents to show how these rights were acquired, but they are very ancient...’ There were Bonhams in Wishford from 1287 to 1597 and there was an Abbey in Wilton until 1836. Bonham’s Mead is only partially useable due to wartime dredging of the river and the foreshore has been bought by the Wilton Estate. The custom of holding a key auction at Rogationtide has lapsed. The last time it was conducted no one attended. A single postal bid has been received for many years. The auction was advertised in 2010, but that yielded no additional bids. The rent paid is insignificant and now goes to the St Giles’ general funds.